I’ve made mention of a peculiar use for low carb diets other than for weight loss. You might have heard that low carb is successfully used in children for epilepsy (check out The Charlie Foundation for more info on that), but you might not have known that nascent research is being done independently and somewhat outside the normal protocols to determine if a very – and I mean VERY – low carb diet *might* work as a treatment for cancer. Now let’s stop here for an important warning: if you have cancer, this most likely *isn’t* something for you. First off, for many cancers, traditional treatments do, in fact, work if treated early. It also isn’t a treatment that you can try on your own along with a standard course of treatment. Many of them are incompatible with a low carb diet. It also has only been tested in mouse models – and for only certain types of cancers. You’d need professional guidance if you wanted to see if this was right for you. There’s also this: the theory as to why it might work contradicts decades of research. Hear a quacking sound? Cancer has been called the ‘Emperor of all maladies‘ and had attracted charlatans willing to turn a profit on other people’s tragedy, peddling false hope and leaving their families penniless. This one is somewhat different, however, and we’ll get to that in a moment, but first you must meet Otto Warburg, but to meet Mr. Warburg we need to go back 90 years and also revisit out high school biology class for a little refresher. I promise I won’t get too ‘sciencey’ and I apologize beforehand to those readers who know this stuff way better than I ever will. Forgive me my simplistic explanations – but please call me out if I state something patently incorrect. I don’t want to misinform. Most of the cells that make up this container we call you and I contain mitochondria. There’s a hundred fascinating things about these parts of the cell – you can only get them from your mother, for instance, and they have their very own DNA that is completely different from yours – but lets focus on the what they do for you. Mitochondria are considered the ‘powerplants’ of your cells and create the energy the cell needs to survive. They do a bunch of other things, but one of the important parts for our discussion is the energy production. Otto Warburg was a researcher who, in 1924, noticed that the mitochondria in cancer cells didn’t properly respire – as in ‘breathe’. Yes – cells breathe, which is why *we* breathe – to get the oxygen the cells need to properly respire. But cancer cells didn’t respire properly – instead, it appeared that they took a different approach that only allowed them to feed only on glucose. Now, just because a cancer cell’s eating habits are different doesn’t quite explain why they’re cancer cells (at least that I know), but it does point out a cancer cell’s Achille’s heel: they’re sugar addicts. As sometimes happens in science, some guys in lab coats scratched their beards, mumbled something about this being ‘interesting’ – and then it was mostly forgotten except perhaps as trivia while science marched forward with cancer treatments using surgery, chemotherapy, and radiation. Cancer treatments did get better, but now we’ve reached a point where new treatments might only add months to a patient’s life. Then along comes Thomas Seyfried who writes a textbook named Cancer as a Metabolic Disease which challenges many of the standard notions about the treatment of cancer and recommends an extremely low carb diet instead of chemo – and gets himself into a mess of trouble – at least from a career standpoint. Dr. Seyfried is a legitimate researcher who comes out with a book that overturns 50 years of thinking on cancer. This is going to attract two things: crackpots and the label of ‘quack’ from his peers. I simply do not have the skill-set to judge his work as I am not an oncologist, but he had laid out a legitimate attempt to create a new way of thinking about and treating cancer and no one can deny that a low carb diet might be a heckuva lot better treatment for cancer – if it works – than chemo and radiation. Simply put: normal brain cells can live on ketones – cancer cells can’t, so a super-duper low carb ketogenic diet starves the cancer cells while normal cells survive. He doesn’t come off as a quack – more frustrated than anything. His last answer in the Q&A is his most damning: if the standard of care raises blood glucose, then it leads to the ‘demise of the patient’. You can see how his theory is a ‘turd in a punchbowl’ for anyone in the medical community invested in the current standard of care. Here’s an example from one of his naysayers. It’s a well-reasoned criticism and well worth slogging through to help to begin to understand the point of view of the medical community. How *I* got exposed to this was because a friend’s relative was diagnosed with a glioblastoma – a type of brain cancer that is pretty much a death sentence. I was reminded of the article I had read about a woman who was treating her brain tumor with a ketogenic diet and was even keeping a blog about it. I provided the link and my friend and their family, after a lot of research, decided on a doctor-supervised ketogenic diet. It’s too soon to tell at this point if this was the right approach, but given what I’ve read about glioblastomas, there’s not much to lose. Doing my own research I came across a website that offered a complete diet book for cancer patients trying a ketogenic diet, bought a copy and read it from cover to cover. I’ve read plenty of other books on ketogenic diets, but this one comes not from the weight loss community but out of the childhood epilepsy community where the stakes are higher. We’re not talking about fitting in that cute little dress but preventing debilitating seizures in small children – or not dying from cancer. This is the most extreme low carb diet I’ve ever seen – because most diets try to make it comfortable for the patient. While this book bends over backwards to do the same, its primary goal is to manage a threatening disease. I thought it would be interesting to try this approach – what the heck – and did it for a few weeks over the summer. Even though I am an old hand at ketosis, this was hard. I felt like passing out one hot summer day walking a nearby downtown, which I summed up to dehydration: you don’t store *any* water weight on this diet so it probably made dehydration a huge possibility. I felt much better after a bottle of water and a salad. I didn’t keep up with it but I consider the book an excellent reference for anyone interested in what an ‘extreme’ low carb diet looks like. I have to admit that my own diet is in tatters as I write this but if/when I get up the gumption to start again I am going to use this book as a guide – perhaps not going as ‘full-on’ as a cancer patient might, but rather as a target I can afford to miss, given that even coming near to this protocol will still be a very adequate ketogenic diet. Let’s start slow here, OK? Once upon a time a guy went on a low carb diet and lost 80 pounds, bringing his decidedly pudgy exterior down to a perfectly fine 185. Of course, weight never stays off unless you are a total maniac about your diet – and this guy wasn’t – he was pretty awful at low carb, though some points should be given for some amusing hare-brained experiments along the way. The weight loss stayed for about three years but the onset of middle age – and perhaps a well-honed laziness crafted into a fine art- caused the weight to creep back on. It was manageable for many years and a diligent return to a hard-core low carb diet each time things got out of hand always got it back down, though later years the weight tended to stay in the low 200s. Then a decade passed. a WHOLE FREAKIN’ DECADE on a low carb diet. That’s a lot of time on a diet that makes one a bit of an oddball. Despite a lot of evidence that a low carb diet is helpful and safe for a lot of folks – and personal experience showed that it worked for this particular schmuck, he kinda drifted away from it. There were some valid reasons for this drifting away. Some less so. Regardless, this guy went from someone who struggled with following a low carb diet pretty much every day – even if he failed miserably – to someone who wasn’t even trying anymore – and that gradual drift happened oh-so unconsciously, until the man awoke to find that perhaps he didn’t know how exactly to do a low carb diet anymore. Perhaps they didn’t work for him anymore and what once worked no longer would. perhaps the person he was 10 years ago when he lost the weight was gone and the person he was now couldn’t do what he had done then. Perhaps he just didn’t want to be on a diet forever anymore. This was all well and good, but a very real problem existed: he was getting fat again. He was outgrowing the fat clothes he bought. Breathing in his clothes might become a problem. Buttons might begin to pop. It was fun to eat Italian deli sandwiches. Bread is an awesome thing. So was pasta. But it seemed there was no way to dance on the knife-edge of having some without having too much. His appetite went out of control and a taste always became more than a taste. 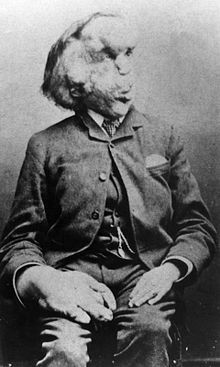 Joseph Merrick, known as ‘The Elephant Man’ was a normal human stuck inside a deformed body. The story that I had heard was, because of his deformity, he had always slept upright. But one time he wanted to sleep like a regular human being – lying down. His simple desire to be like other humans is supposedly what did him in: due to his deformities, lying down choked him to death in his sleep. Perhaps there’s a lesson there the man needed to accept. 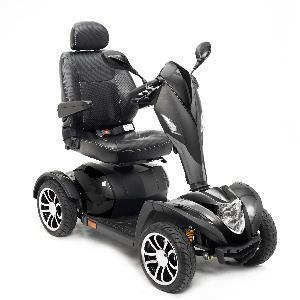 I can’t believe just how hard it is to pick a good mobility scooter. Do I get 3-wheel or 4-wheel? Folding or non-folding? Do I assume that I will make it to 400 pounds and opt for one that I can use long-term? God – there’s even a *turning radius* I need to concern myself with. Maneuverability in a crowded store on a Saturday is a must. Then there’s seat height. If the seat is too high I might not be able to reach the lower shelves in the grocery store – but too low and I won’t be able to reach the high ones! I’ve never made a detailed analysis of my shopping patterns to determine if I tend to buy more foods from the higher shelves than the lower. Perhaps I should start gathering statistics on this. 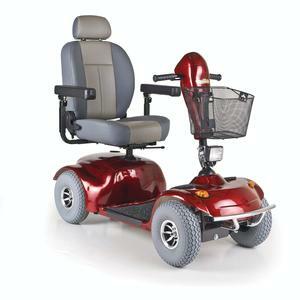 There also seems to be a point at which a lift for your vehicle is a must as these scooters can get heavy. That means I have to decide if I want to trick out my ride – a 10-year-old minivan – with a custom lift. I haven’t even priced those yet. Let’s not forget about the importance of style. You don’t want to do your electrified cruising through the aisles in something that doesn’t reflect a level of discernment on your part. 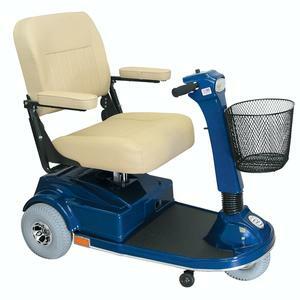 Some of these scooters are downright stodgy – I’d like to reflect a more modern and polished image. Beige and blue with an office wastebasket tacked to the front? You can’t be serious. Some try to effect a ‘Harley’ look so you can feel like you’re riding a hog, Steppenwolf’s ‘Born to be Wild’ playing in the background with your biker chick riding behind, her hair blowing back in the wind – instead of just you whirring about on a mobility scooter with a max speed of 4 miles per hour. 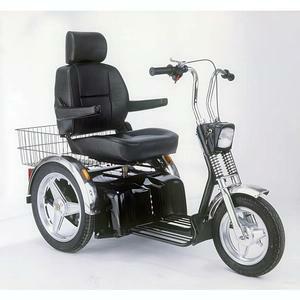 Others are decidedly futuristic, taking a page from the Japanese motorcycle esthetic. I don’t know if I’m more a Harley guy or a rice-burner type, not having been a motorcyclist. People into these things are quite religious about their choices. This choice would put me firmly in one camp and make me a pariah in another so I must choose carefully. Making the wrong esthetic choice could hamper my social life. Some have names like ‘Prowler’, ‘Maxima’, and my favorite: ‘Avenger’. The definition of the word ‘avenger’ is: one who inflicts punishment for injury or offense. Will I be able to fight crime and make America a better place while buzzing through the candy aisle on an Avenger? The Avenger. Is anyone really going to fight crime on one of these? I think I’d better get the hell back on my diet so I don’t need one of these things!